The work of the noted British designer, George E. Kruger-Gray, this simplified version of the Canadian coat of arms consists of a shield divided horizontally into thirds. The first division contains the arms of England (three lions passant, heads turned toward the viewer with the right foreleg of each beast raised) and the arms of Scotland (a lion rampant surrounded by a double band, which is decorated on each side with fleurs-de-lis). The second division contains the arms of Ireland (the traditional harp) and the arms of Royalist France (three fleurs-de-lis, symbolizing the Trinity). The final division, three maple leaves on one branch, represents the Canadian nation, created by the efforts of all her peoples, regardless of their origin. The right shield supporter depicts a lion rampant (England) holding a lance from which flies the Union Jack; the left supporter, a unicorn (Scotland), holds a lance flying the arms of Royalist France. The shield is surmounted by the British imperial crown. 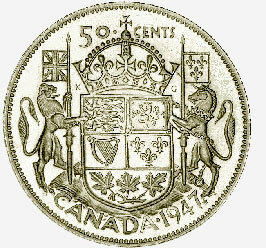 The denomination, 50 cents, appears at the top of the coin, with CANADA . 1947 at the bottom. A small maple leaf to the right of the date indicates that the piece was actually struck in 1948, and the initials K and G which appear beside the lower portion of the crown are those of the designer. This coin forms part of the National Currency Collection, Bank of Canada.